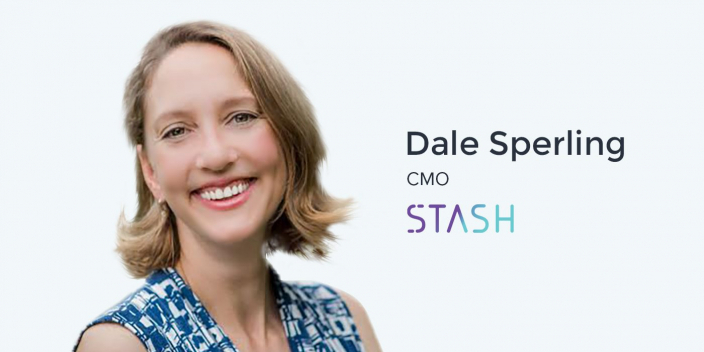 Dale Sperling is the CMO of Stash, a consumer financial technology company that allows anyone with a mobile device and at least $5 to start investing immediately. Stash has acquired over half a million new users in 2017 with over 25k joining every week. In June of this year, the company raised a $40 million in Series D funding. Dale started her marketing career at AOL in Impact Marketing and Sales Development. She has also worked at the Walt Disney Internet Group and cofounded CreatorBox in 2014, a build-it-yourself toy experience for parents and children to do together. She has been with Stash running marketing since May 2015. Determining which paid and organic traffic sources generate the lowest CAC and highest conversion rates is a daunting task for marketers. One less technical solution is to simply ask users how they found out about a company. However, even this doesn’t necessarily generate reliable data. It’s possible that the growing importance of video content is the single most important modern marketing trend to include in your marketing strategy. Instead of looking at video as another type of content or an independent channel, video content should be integrated into everything a brand does to drive awareness, acquire customers, retain users, and drive both loyalty and evangelism. Educational content is especially important for a very top of funnel audience without awareness of a need for the product in the first place. For Stash, an investment platform that demonstrates its greatest value over time, delivering new educational value on a regular basis reminds new investors why they should continue to engage. Ander: This is one of the many interviews that I am doing while I’m here in New York on this little adventure for the Advertising Influencers podcast and for Instapage. Today, I’m speaking with Dale Sperling, the CMO here at Stash. Dale, thank you so much for inviting me into your office here, for making the time to chat, and for sharing some of your insight with us. Really appreciate it. Ander: I gave a little bit of background to who you are, and what Stash is. But the best way to get started is hearing it from you. Dale: Sure. Stash is investing simplified. Anyone with a smartphone, two minutes to spare, and five dollars can sign up for an account with us and start investing with five dollar minimums. We provide education and guidance and we really empower people to learn to invest and invest with confidence and do it themselves. Ander: That is awesome. And, as the CMO here, you’ve been here for about how long? Dale: I actually started with Stash before it even launched, so this July was my two year anniversary. Now the other thing that I would love to know, and I’m sure everybody listening would love to know as well, is a little bit about how you got here, what is your sixty second professional journey in a nutshell? Dale: Sure. So, I started out after college. I took an internship at AOL. Ander: Did you study marketing? Dale: I did. Marketing, Business Management at Rutgers. And I actually didn’t know what I wanted to do coming out of school. I wasn’t totally enamored with marketing. Thought maybe I wanted to be a teacher. But I was following the money and thought that marketing would be a great place since that’s where I got my education. I started in a marketing services team at AOL and really just learned the ropes from the ground up. Got really involved in a team that was doing promotion marketing, so I was the sweepstakes girl. Dale: Which was always exciting! You know, sales, sales presentations, and I think what was unique with how I started and then where I jumped around from there was that I did a little bit of everything. So, once I got a handle on a particular skillset, I was ready to tackle something else. I wanted to learn everything about how advertising worked and how ads were served and the tracking and reporting and I loved the data and the details, so I jumped around a lot. Ander: I’m sure that that all extended to email marketing and all of the other things that you can do as marketers now. Dale: Yes. So, a fair amount in re-engagement and what we used to call CRM, which is now re-engagement and retention. Dale: And then did a lot of product marketing and really had a touch on everything to brand marketing, product marketing, re-engagement and retention. And what we used to do was marketing; now it’s called growth hacking. Ander: Right. Haha. Or any of the other millions of other terms that people are using to describe marketing now. Now, I guess I could call you a full-stack marketer. Throughout your career and as you’ve developed your skills, what has your marketing philosophy become? What’s something that might have surprised you along the way as all these new channels have come out, new technologies, things that we never could have imagined maybe ten, or five years ago, even? Dale: Really what, I think, all of these new channels, new partners, and new ways to connect with people comes down to is being open to testing everything. Dale: And not getting stuck in the old ways of doing things or what you know is going to be something that’s going to perform, but having an open mind to a new path to something. And, testing in a small way and killing it if it doesn’t work, really quickly. Dale: Failing fast! It was never really an approach that I had done in previous roles, but now with so many options if you’re not trying and learning constantly, you’re falling behind. Ander: Yeah. And how does that come into play here at Stash? What are some of the experiences that you’ve had in your two years here where you’ve actually seen that play out in one way or another? Dale: I mean, we really embody that here at Stash. It’s ingrained in our culture. When you start at Stash, you get The Lean Startup. It’s like our bible here! Dale: Yes! And everyone’s given the power to test and try new things and break things and do it fast and fail fast and move on and learn and iterate. We do that on the product side, in engineering, and in marketing. And I think it’s clearly seen in marketing as we’re always open to testing new stuff, any crazy idea. If it aligns with the KPI that we’re heading towards, then we’re willing to test it. Ander: Awesome. Is there any test that you’ve run that just kind of blew you away, surprised you? You know, maybe someone had some obscure idea and you said, ‘Well, we can test it. Let’s see what happens,’ and it just kind of blew your mind? Dale: That’s an interesting one. Blew my mind. I’d say that one thing that blew my mind on the negative side is a test that I thought was for sure going to perform. Everyone’s been saying ‘print is dead’ for a long time and there’s this slow revitalization of print and something unique to it, right, for this new generation who’s had all digital and now it’s something tactile that they could see and connect to. So I was convinced that on-demand engagement print piece would be very relevant and we tested it and it failed miserably! Dale: I was floored! I thought for sure this was going to be an amazing channel for us because the costs are so amazingly scalable, or the production is scalable, the costs are low. And it’s personalized and printed on-demand based off of triggers and real live stuff that’s happening that you’re doing in the app. And it failed miserably. Ander: Was this like direct mail marketing and postcards? What exactly was it? Dale: It was postcards that were triggered from things that happened in your account that made you feel that we were connected, on another platform, in another medium. Dale: We’re doing a lot of programmatic testing and particularly finding a way to do some programmatic broadcast testing and it’s been wildly successful. Ander: Awesome. What’s an example of that? Dale: So we created a video for digital and it was very low budget. We had a whole bunch of low budget videos created because I love to test and test small and then build out a more robust experience based on what works. And so one of our cost-effective videos that we had created performed really well and so we stepped up and started using it in other mediums, Taxi TV, and then we tested it in broadcast. And I was a little hesitant because it wasn’t of the highest quality production and it actually performed wildly successfully. Ander: Are we talking about traditional broadcasting? Ander: You know, it’s interesting. I have this theory and the theory is slowly being proven… I guess it’s a hypothesis or whatever it is. Marketing is cyclical and I’ve always thought that it’s going to come full circle. Billboards are going to become relevant again, postcards are going to become relevant again, and so is TV, local TV markets and stuff like that. So you guys had success with that? Dale: Yes. And we’re interested in pursuing that further and we’ll see. We’re starting to really put a lot of effort behind video and build from a digital standpoint and now doing some investments to make some higher quality stuff for broadcast. Ander: There are so many companies that aren’t doing broadcast. When you mentioned broadcast at first, I didn’t know if you meant, like, livestreaming or something like that. That’s so, so cool to me. So with those TV spots you’re running, maybe they’re thirty seconds? Ander: Ok. And you shot these on a super low budget, you mentioned. Ander: How did you track the success of those? Did you just look at lift or was there a URL? What were you guys doing? Dale: Yeah, so no URLs. We look at incrementality and lift overall. We geo-test and make sure that we’re seeing lift in a specific geo and that there is no, sort of, cannibalization from other campaigns. If it’s performing well from a CPA standpoint, we’ll test again and keep testing. And as we expand the geos and see if it holds, then we’re off to the races. Ander: Have you guys figured out a way to figure out whether it’s a questionnaire or something if someone has come from a TV ad? Dale: We do collect some information through customer service and when we do surveys we get that feedback. And just like the subway gets customers, it’s the same exposure. Oftentimes people misrepresent where they were exposed and even though they had seen the subway and had Facebook ads ten times sent to them and had an in-app ad, they might say that they heard us on the radio. And we weren’t running on the radio in that geo, right? So people 90% of the time get it, but there’s a fair amount of people who don’t know and they make it up. Ander: It’s funny. I never really thought that attribution is difficult for the customer as well as for the marketer. Ander: Let’s shift gears a bit and talk about Stash and talk about what I guess I could call the consumer financial technology industry. Is that fair to say? Ander: Ok, cool. There’s so many different apps out there. I mean, there’s, Acorns and Betterment and all these different things you can choose from. I mean, there’s probably twenty that come to mind for you, anyway. I played around with Stash – and I have my investments set up through something different – but it’s a really, really cool platform. One of the things that you guys say in your ETF portfolios is ‘Portfolios as unique as you.’ And you have personas behind them, like the techie, the environmental enthusiast, or whatever it’s called. I might be using the wrong names. What inspired that idea? It’s really interesting to me. Dale: With our app and the service that we provide and how we’re different from many of our competitors, is that we want people to invest with intent. And we want you to save and invest and know where your money is going and when you care about what you’re investing in and when it matters to you, you feel more ownership and you’re a shareholder and you’re more likely to be in it for the long term and really feel as if it’s something valuable that you’ve invested your time and thought and put yourself into it. You’ve invested yourself as well. So really we named all of our investments for that, to have that connection with people, that relatability, so that, you know, instead of Berkshire Hathaway B, we call it Roll with Buffett. Dale: And feel like, ‘Hey, I wanna roll with Buffett…’ Really it’s Berkshire Hathaway B, but we’ve made it relatable for that new investor who now feels like, ‘I’ve got a partial share of Warren Buffett’s thing,’ whatever they see that as. The ‘investments as unique as you’ is really so that user knows that they can invest in what they want and what they believe in and make their own portfolio work for them. Ander: Was that the vision of the founders when they launched the company? Dale: I believe that vision evolved. Dale: Choice and the personalization of the portfolio was always a piece of it but really the company was built from this concept, this ‘aha’ moment, that people aren’t investing because they think it’s too expensive and they think they don’t know enough and it’s unrelatable or they think it’s something that they can put off for a future point in time. Dale: So the initial launch and the way the app was created was to solve for that, allowing people to buy fractional shares. We’ve curated a set of ETFs, so we take that paradox of choice out of the space and you now have a set of curated ETFs that you can relate to because we’ve renamed them to be something that you can connect with. Ander: Interesting. And a lot of the other platforms out there you’re either investing in something super generic – you don’t even necessarily know which stocks you’re investing in or which funds or whatever. I like how you guys do that, how you break it down into something that’s almost value based. It’s really, really cool. Now that said, this whole industry, there are a lot of mobile apps that are allowing people to invest quickly, that are allowing people to invest with not a ton of money, not rolling in tens of thousands or hundreds of thousands of dollars like many seasoned investors who play the stock market might be doing. What are some of the unique marketing challenges that exist within this space and how is Stash working to address those challenges? Dale: I think one of the most important things in this space with all these apps and services that are allowing people to invest with these low minimums is that people don’t know what they’re doing. They’re getting in the game because they know they should and we’re getting to a point where people understand what investing is and that they should be doing it and we have all these different options. For instance, you could be a Robinhood customer and you get access to free trading but you don’t get that educational component that you get with Stash. Dale: You can join Acorns and you can round up your purchases and save money. Again, you don’t have that educational piece and the focus isn’t investing. It’s saving. From a marketing perspective, getting people to understand that they should be doing it and then also delivering on that experience of what they should have from both an education standpoint and an intent standpoint, and that future looking state of why they’re doing it, is an important piece to communicate. Ander: So one of the challenges that I imagine every single company has in this space, you know, mobile apps on your phone where you can be investing money, etc, is this trust factor. It’s not a bank, it’s not something that is quote-unquote ‘traditional.’ It’s new technology. And even though there are people throwing thousands of dollars into Bitcoin where it’s even more unpredictable, there’s still a big question about the security behind what is happening with that money that you basically entrust to this start-up to invest for you. And I know that, you know, all of the legal stuff, all of the government regulations are in place. You guys are following all the rules and everything and all of these companies are following the bureaucratic steps of the system to make sure it’s all secure. But, what about the messaging? What about communicating that in a tangible way to somebody who is not yet totally sold on the idea? Dale: So this is a marketing challenge, obviously, and something we all deal with and causes drop in our funnel all the time. We know those key points where people get a little nervous about putting their bank details in to fund their accounts. And that’s universal across all of our competitive set. Dale: And we message them with all the security protocols we have put in place. But ultimately it comes down to trust and can we create a relationship through our messaging, through our visuals, through the brand association, through word-of-mouth, that they know their friends invest and their friends haven’t had any issues so far. Dale: So far, so good, right? Can we get that trust from that consumer? And that evolves over time and so if they’re not ready to take that step with us because they’re nervous about Stash as a company and our viability or just investing through a mobile app, we have that line of communication open with them and we provide them content and education and we still send them, every week, all of our great articles that we write that are timely investment articles telling them about the investments that they could be in and what’s going on in the market. We take that softer approach where we build that brand trust and over time convert them to understanding we’re here, we’re providing value and we have your best interests at heart. We’re a registered investment advisor and we have a fiduciary responsibility to act in our clients’ best interests. So it’s a slow engagement, a gradual engagement model of building that trust and once you have that trust, it’s like the Holy Grail of that marketing experience. Ander: Yeah, that’s something that I can certainly understand. I’m wondering how much those personas, the ‘portfolios as unique as you,’ going back to what we talked about earlier, I wonder how much that contributes to the trust? I’m a musician and if I see, like, the musician ETF or whatever it is, I feel like that might resonate with me. I don’t know if that’s something that’s actively been considered by your team or not? Dale: You know, I think so. We hope, right, that you connect to that versus just maybe a single investment. It’s also a way for us to sort of merchandize the investments. If you think of it as a wonderful store window and you’re looking in and one particular investment might not connect immediately with you. But if we can connect you from a personality standpoint, that might be that connection. We’re working to sort of build that into the app experience. Right now that’s just on the web. But I think it’s one angle that works, giving people the ability to choose and connect on a personality level just works for millennials, oftentimes. They like that nice, clean, packaged-up opportunity. Ander: Yeah. And keeping things simple is incredibly important. One of the things that’s interesting about investing is that the value is not as directly apparent for a period of time. You sign up for a product, you put your money into that investment, and then you’ve got to wait a little while. It’s not something that happens overnight. It’s not like you’re playing a hand of blackjack or anything else like that. What are your observations around how that affects some of the retention that you have to work on, making sure that people really are understanding why they have this money there in the first place once they do it? Dale: ‘It’s not a hundred dollars yet.’ Haha. And so the challenge is to educate them about investing at regular cadence and it’s fine to invest small amounts, actually we encourage people to invest small amounts. If you have a hundred dollars to put in, we don’t want you to put it in all today. We want you to spread it out so you have the opportunity to do dollar-cost average, catch the highs and catch the lows and that’s the way to invest with the most confidence so you don’t have to time the market. Really the opportunity is that low minimum but educating people around what you do after you make that first investment and how you should invest on a regular cadence and how you should save and invest with intent is that opportunity that we attack with education. Ander: Mm-hmm. And I imagine that same thing applies to any product where it will take time to see the ROI that you put into it. So taking everything we’ve talked about, kind of looking holistically at a lot of the themes that we’ve discussed, especially in the financial industry with these consumer fintech products like Stash, where is marketing heading? What is the future of marketing? And what do we as marketers really need to do to prepare for this future, to keep all of these changes in technology and processes in mind? Dale: The big headline here is data. It’s becoming more and more data-driven by the minute. And I think from an education standpoint, people that are in marketing tracks and have that as their major in college, I do see the curriculum changing and I think there’s going to be a growing need for marketers coming out of school in their jobs to level up and start learning more about how to crunch data, read data, analyze, visualize, all of the above. We might see job descriptions for a traditional marketing role now have requirements for statistical analysis and other things that we haven’t seen in the past, that certainly I didn’t need to have, which, thank god because I hated statistics! Haha. Dale: But I think data is going to be a big driving force moving forward for marketing, especially here. I mean, we’re making all of our marketing decisions on data. Dale: So that’s one big thing. Also, video consumption. Ander: Especially with your TV ad spend. Dale: That is happening! But all of the consumption of content online, digital, and all of these new channels popping up for users to consume video. If you’re not in that space from a branded content standpoint, from an entertainment standpoint, from a commercial standpoint, however you want to represent your brand or get in the game, you have to be creating some video content. And it has to be a big part of your content plan or else you’re going to be left behind. The banner blindness saturation of the marketplace is crazy. Dale: And specifically the millennial audience right now is consuming more and more video by the day. So that’s a big effort for the future, I think, for marketers to continue to put emphasis on and create unique new video that really engages their users. Ander: Awesome. Yeah, we have a full-time in-house video team at Instapage and it was quite an investment. But it’s awesome. I mean, they’re churning out these amazing videos every two weeks or so that are just super high production quality. So I totally agree with that. Ander: Flatiron, ok. I get a little more familiar with my New York neighborhoods every time I come here. Ander: This really is the best conference room! Dale: It’s called Young Money. Ander: Young Money. There’s fascinating constellation wallpaper all over the place and they’ve got a great kitchen as well, so I will leave it at that. Dale, if people want to check out Stash, what should they do? How should they learn about you guys? Dale: They can go to the app or play stores and download Stash. Or go to our website stashinvest.com and just read more and learn and check out some of our educational content and get to know the brand. Ander: And start with only five dollars. Dale: Start with only five dollars. But don’t stop there! Put in more! Ander: Haha. Right, exactly. Well, Dale, thank you once again and I’m sure we’ll talk to you soon.